Light and Shadows. Awake and Dreaming. These dimensions are the primary focus of Lucky Pause’s Homesick. 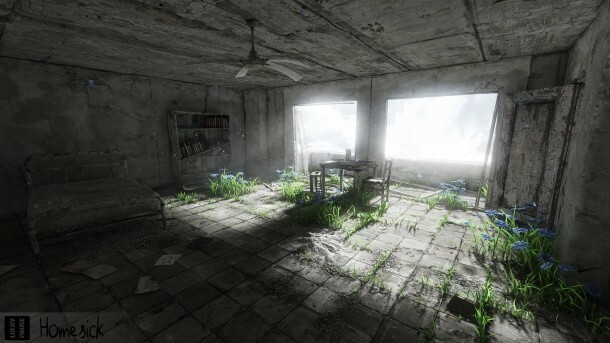 In the waking world, players explore a decrepit abandoned building, and they can’t go where they are blinded by sunlight. When they are asleep, they are haunted by nightmares and pursued by darkness. Despite the presence of (admittedly creepy) shadows, Homesick should not be mistaken for a survival horror title. Instead, it is a first-person puzzler and exploration game, not unlike Gone Home. The goal of the game is to figure out what happened to the building–and the player-character — by solving puzzles, unlocking new areas of the building, and exploring every nook and cranny. While the primary mechanics are walking and looking (which is done by clicking on objects with a circular reticle), there is also a streamlined inventory mechanic, which allows players to collect necessary objects or keys. I returned to play Homesick twice during my time at PAX East. Both times, my demo felt like it ended far too soon. The atmosphere of the game is incredible. Soothing piano music plays in the daytime as dust particles languidly float through shafts of light. Every surface is covered in detail: wallpaper peels from walls in sheets, flora peers through gaps in the tile, and accumulated grime on other surfaces attests to the age of the building. The puzzles were challenging but not to the point of being disheartening. I felt, at all points, as though I was capable of solving the task that I was presented with, even if I wasn’t entirely sure of all the intermediary steps. The nighttime gameplay was an entirely different matter. Instead of allowing me to leisurely solve puzzles, I found myself running from crackling, amorphous shadows that pursued me down the hallway and into previously inaccessible portions of the building. When I woke up, I found that I could access those areas as a result of my actions during the nightmare sequence. Homesick was funded by Kickstarter and is currently in alpha. Even now it is clear that the game will be a more cinematic experience — something meant to be experienced rather than simply beaten. Homesick is slated for launch on PC and then on Mac, though there is not yet an anticipated date.